I’ve taken the week off from running to rest from last weekend’s San Diego 1/2. This leaves me with nothing notable to jot down about running, right? (You must not know me very well.) The past week has been a great week to take a break from running because life has come at us full force. We’ve rented our home (our new home won’t be finished for another 6-8 weeks), which leaves us a bit homeless for the next two months and moving twice. Amidst this chaos we’ve had sick children, pink eye, baseball tournaments, graduate coursework, and life in general. Needless to say, we’re running non-stop. 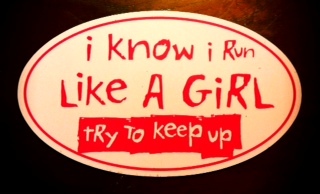 I found this at the race expo last week, and though I’m typically not one for all of the running clichés I found this quite humerous. Not because I run fast, but because life is running fast at me and I’ve found myself trying to keep up. It’s been a little tough, a little stressful, and a whole lot of sleepless nights. I’ve found myself getting sucked into the stress and losing sight in the humor of it all. Thanks to my kids who keep up the constant humor in the house, I realized I needed to take a step back in order to keep up. Time to find the lighter side. It’s too easy to stumble and get lost in the dark.